It would be all too easy – not to mention, predictable – to proclaim we are wading through the twilight years of the motorcar; a slow and sorry decline brought about by all manner of crossovers and SUVs, powered by downsized engines, soulless electric motors, and autonomous algorithms. But hang on a minute. We defy you to have a scroll through this list and tell us that the car – cars we admire and aspire to own – are on the way out. Yes, there are more electric cars than ever, but they come from Aston Martin, Porsche, Mercedes, Audi and Volkswagen. Not to mention Byton, the startup set to ruffle Tesla’s feathers. There’s also a 1,900 horsepower hypercar from Automobili Pininfarina, the fabulously retro (and very much petrol-powered) Ferrari Monza, a new Toyota Supra, and even a Renault Clio in a sharp new suit. Then we have the highly anticipated rebirth of the Land Rover Defender, and we’ll see more in 2019 of the astonishing Aston Martin Valkyrie. So whether you’re looking to drop a couple of mill on a new electric hypercar, or you’re on the lookout for a new supermini, the new cars of 2019 will have you covered. Recently spotted testing in Welsh woodland, the DBX is to be Aston Martin’s first SUV. Yes, we know, but the popularity of Porsche’s Cayenne and Macan mean the 911 and Cayman have been given the resources to thrive. So by that logic, the DBX - undoubtedly set to become Aston’s best-selling model – will pump heaps of cash into the rest of the family. Expected to be seen in production-ready guise later in 2019, DBX will of course go up against the Bentley Bentayga, Lamborghini Urus, Rolls-Royce Cullinan, and the so-called ‘Ferrari Utility Vehicle’ due around 2022. The Aston will likely be powered by the company’s AMG-borrowed 4.0-litre V8, and there’s talk of V12 and hybrid options also in the works. Just don’t expect James Bond to pick one up from Q Branch any time soon. Not a fully-fledged mass-production car as such, the Rapide E is Aston’s first all-electric car, but just 155 examples will be built. As such, you can see it more as an explorative dip in the water, ahead of Aston reviving its Lagonda brand for a luxury electric limo in the next decade. Back to the Rapide E, and we can expect to see it launch later in 2019 with a modest 65 kWh battery pack delivering the equivalent of 600 horsepower to the rear wheels. Despite the heavy battery in place of the usual V12, the car will hit 60 mph in under four seconds, have a top speed of 155 mph, and a claimed range of 200 miles. We already know a lot about Aston’s upcoming hypercar, but there will no doubt be some extra details to come out through 2019. Due to arrive with buyers at the end of the year, the Valkyrie is the road-legal brainchild of Red Bull F1 designer Adrian Newey, and is powered by a 1,100-horsepower V12 with assistance from a hybrid system. Such is Newey’s focus on lightness and aerodynamic performance, the car can be bought with a one micro-thick, laser-etched nose badge, which sits beneath the lacquer of the paint, preventing it from disrupting airflow. You can also ask for no lacquer detailing on the engine - to save 80 grams. Just 150 examples will be made, plus a further 25 of the track-only Valkyrie AMR Pro, with prices falling between £2m and £3m. They’re all sold, naturally. Already in mass-production, Audi’s first fully electric car will arrive in dealerships this year. A luxury SUV priced from £71,500, the e-tron will offer a zero to 62 mph (100km/h) time of under six seconds, and a range of up to 241 miles. Not quite Tesla stats, but we fully expect Audi to teach Tesla a lesson when it comes to interior quality and drama-free mass production. The e-tron will pave the way for several all-electric models from Audi over the next couple of years, including the e-tron GT and e-tron Sportback. Legendary Italian design house Pininfarina now has a car company of its own, called Automobili Pininfarina, and it’s going to leap straight in at the deep end - with a 1,900-horsepower electric hypercar. With a motor driving each wheel, the Battista is to arrive with buyers in 2020, but will be revealed in production form for the first time on 4 March, ahead of its public debut at the Geneva motor show the following day. Designed to be a luxury continent-crusher rather than a weekend track toy, the Battista is claimed to serve up 62 mph in under two seconds, reach 217 mph, and have a range of over 310 miles, thanks to an electric system developed by Rimac. The production version will be revealed on 4 March. Going on sale later this year, the iX3 will be BMW’s first electric SUV, and its first fully electric car since the i3. The car will be dropped into the closest-fraught sector of the electric car market, with rivals including the Jaguar I-Pace, Mercedes ECQ, Audi e-from and Tesla Model X, with the upcoming Model Y also a threat. BMW hasn’t said much about the iX3 for now, but it is expected to feature a dual-motor setup with one driving each axle, and a range in the region of 250 miles. Despite the lack of information, BMW opened pre-orders for the iX3 in EV-loving Norway last year, with 1,000 deposits placed in less than a fortnight. We’ll likely see much more of the iX3 going through 2019, ahead of deliveries arriving in 2020. Revealed in production form at the CES tech show in January, the M-byte is the first car to come from Byton, a Chinese startup with an ambition to topple Tesla. Unusually, Byton’s production-ready car boasts an even more futuristic interior than the concept revealed a year earlier. There is an enormous screen which spans the entire 48-inch width of the dashboard, plus a 7-inch touchscreen mounted in front of the steering wheel to act as a control centre for the infotainment system, and a third 8-inch display between the front seats. Meanwhile, voice controls will be handled by Alexa, thanks to a partnership with Amazon. The circa-£35,000 car will be offered with a choice of battery sizes - 71kWh and 95kWh - with range being a claimed 248 miles and 323 miles respectively. Revealed in 2018 but going into production this year, the striking Monza SP1 and Monza SP2 are a pair of stunning retro-inspired cars marking the first instalment for Ferrari’s new Icona range, which draws inspiration from the prancing horse’s back catalogue. The names denote the number of seats buyers wish their car to have, and under the classically curvaceous body sits the chassis and running gear of the 812 Superfast. That means a 6.5-litre, normally-aspirated V12, but with a small power increase to 800 horsepower. The lack of non-essential items like the windscreen, roof and door pillars means the weight is 15% down on the Superfast. Deliveries begin in the summer, and you can bet your bottom dollar they’re all sold. Honda won our hearts with the adorably retro Urban EV Concept back in 2018, and set our pulses racing when it pledged to put the car into production. The question is, will the production-ready car revealed at the Geneva motor show in March still resemble the beautifully Seventies concept, or will pedestrian safety concerns soften its bluff lines into something less characterful? We haven’t to wait long to find out. Hotly anticipated by a small but ferociously passionate fanbase, the new Land Rover Defender will finally become a reality in 2019, before going on sale in 2020. Test cars have already been spotted close to JLR’s Midlands headquarters, and it’s now over a year since design head Gerry McGovern said he was close to revealing the new off-roader. There are thought to be two models in development, with 90-inch and 110-inch wheelbases mirroring the original, which went out of production in 2016. An Autumn 2019 launch is on the cards, where Land Rover is expected to show off a wide range of Defender variants, demonstrating how the 90 and 110 models can lend themselves to different applications, from tough off-roader to luxury SUV. 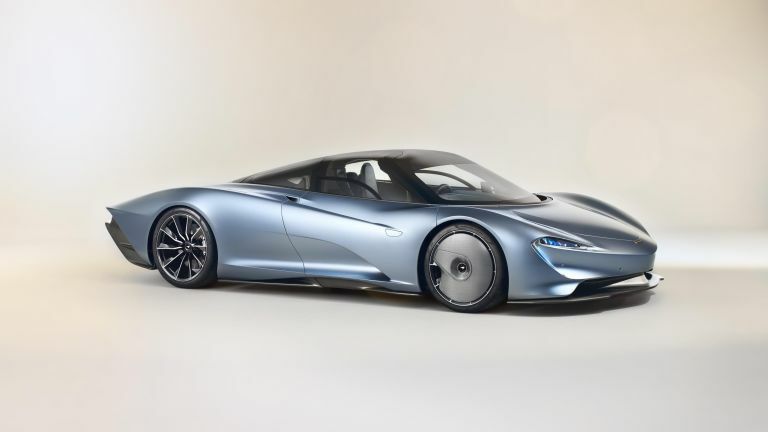 Revealed as a stationary show car late last year, the McLaren Speedtail will turn a wheel later in 2019. The three-seater deliberately harks back to the McLaren F1 of the Nineties, but does so with an eye firmly on the future. As much as the equally striking McLaren Senna was built for ultimate track times, the Speedtail takes a similarly uncompromising approach to straight-line speed and luxury. You can spec a gold nose badge if you like, along with Thin-Ply Technology Carbon Fibre, as used by Swiss watchmaker Richard Mille - a first in the automotive sector. The driver sits in the middle, flanked by two lucky passengers, and followed by a 1,000-horsepower powertrain, the details of which McLaren is yet to reveal. All we know for now is that there’s some form of hybridisation, and 186 mph is dispatched in 12.8 seconds - faster than a Bugatti Chiron. Another first for 2019 will be an electric SUV from Mercedes, called the EQC. Going up against the Jaguar I-Pace, Audi e-tron and Tesla Model X, the EQC is the first of 10 all-electric cars to come from Mercedes between now and 2025. The SUV’s two electric motors are powered by an 80kWh battery and drive all four wheels. A power output of 400 horsepower means a 0-62mph sprint time of 5.1 seconds, but the top speed is limited to a conservative 112mph. Mercedes claims the EQC’s range is 249 miles, which puts it behind the Jaguar and Tesla. UK deliveries are expected to begin in the third quarter of 2019, and prices should start at around £65,000. The first mass-production electric Mini will arrive in 2019, and is to be built at the existing Mini factory in Oxfordshire. Rather than being a bold new departure from the existing lineup of Britain’s favourite retro-mobile, the Mini EV will be pitched as an electric variant alongside the hatchback, Clubman and Countryman models already on offer. It is likely that the Mini EV will share its electric platform with the similarly sized BMW i3. This means power of around 180 horsepower and a range of about 200 miles. The Mini EV will be sold as only a three-door hatchback at launch, but if it proves popular we expect to see more configuration arrive in the coming years. So long as BMW can keep the weight (and price) down - and the Mini’s iconic go-kart handling alive and well - we suspect the Mini EV will become one of the most popular EVs of the early 2020s. Volvo’s entry into the hybrid super-coupe market will kickoff in 2019 with its Polestar sub-brand and mass-production of its first car, suitably called the 1. Not to be confused with Volvos of old - or even today’s Volvos - the Polestar 1 is a carbon fibre-bodied coupe, with almost 600 horsepower and cars like the Mercedes-AMG S63 Coupe and Bentley Continental GT in its sights. The Polestar’s hybrid power train is split between a 370-horsepower 2.0-litre, twin-turbocharged petrol engine, and a pair of electric motors fed by a 34kWh battery and delivering 218h horsepower to the front wheels. In this sense, it is similar to the BMW i8, but with a far longer all-electric range of 100 miles. Volvo is limited Polestar 1 production to 500 examples annually, and the price is expected to be in the region of £120,000. It’s a Volvo, but not as we know it. Launched at the end of 2018, the new 992-generation Porsche 911 will arrive in dealerships through 2019. The car will at first be available in Carrera S and 4S configurations, but we can expect to see more options arrive through the year, possibly including a GT3 variant. This 911 is the first to have been designed with space for a hybrid drivetrain, but this particular model isn’t expected to launch until after 2020. Porsche’s first electric car will arrive at the end of 2019, boasting 600 horsepower, four-wheel-drive, a four-seat cabin, and a form factor sitting somewhere between the 911 sports car and Panamera saloon. The circa-£80,000 Taycan promises a 0-62 mph time of under 3.5 seconds, a top speed of over 155 mph, and range of around 300 miles. What’s already grabbing headlines, however, is how the car’s 800-volt architecture means it can recharge at a rate of 350 kWh, almost three times that of Teslas using the Supercharger network. This will mean super-fast charge times at the Europe-wide Ionity charging network, compatible with cars from Porsche and many others. The second-generation Range Rover Evoque is a lesson in ‘if it ain’t broke, don’t fix it’. The exterior styling and dimensions are very similar to its predecessor. But modern touches include an HD display mounted inside the interior mirror to offer a clear rearward view, and cameras at the front to present the drive with an augmented view ‘through’ the bonnet and engine bay. The former will surely aid rear visibility when driving with three rear passengers, or on dirty roads, while the latter is intended for navigating off-road tracks and high street kerbs alike. Mild hybrid options are available from launch, charging themselves when braking and coasting, and a plug-in hybrid model will arrive in 2020. For the 2019 Clio, Renault has gone with evolution on the outside but a complete revolution on the inside. The headline upgrade to the Clio’s interior is the large 9.3-inch touchscreen, which sits in portrait orientation, is angled towards the driver, and is complimented by an optional seven- or 10-inch digital instrument cluster behind the steering wheel. Renault has wisely retained physical dials for the car’s climate controls, resisting the urge to incorporate them into the touch-controlled infotainment system. It’s a thoroughly modern upgrade to a cabin which had begun to feel somewhat tired compared to the competition. Technically not a new car for 2019, or even 2018, but this year will finally see the first right-hand-drive models arrive in the UK. We might even see the illusive $35,000 entry-level version, which Elon Musk promised back in 2017. The Model 3 was uttered in the same breath as the Ford Model T and original Mini back in 2017 and 2018, such was its perceived importance in the history of the motorcar. But will that still be said when the Model 3 arrives in Britain later this year? Electric rivals from Volkswagen, Honda and Mini will be hoping not. The first member of Volkswagen’s new ID electric car family will land in 2019, in the form of the ID hatchback. Intended to be an all-electric answer to the Golf, but with the interior space of a VW Passat, the ID hatchback range will begin with a circa-£23,000 rear-wheel-drive model with a small 48kWh battery pack and a range of just over 200 miles. A mid-range model is expected to get around 280 miles from its 55kWh battery, while a range-topping 62kWh ID could see a claimed range of 340 miles, VW says, but these figures haven’t been finalised just yet.